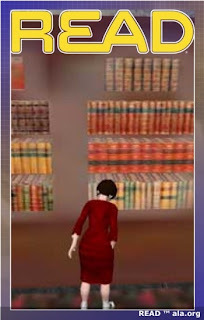 The Shifted Librarian made this awesome READ poster generator, so now you don't need my sweetie's mad Photoshop skillz (or my OK ones) to make your own. Give it a try and add it to the Flickr READ poster pool. 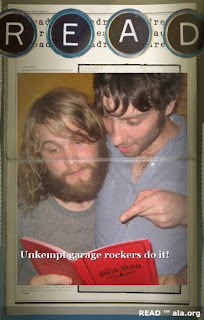 I made another one from a photo on the Chunklet blog of some garage rockers reading the Rock Bible. Pre-order yours today for some Jfro words of wisdom.